The newest and the most happening culinary destination of Kolkata has nestled down in the heart of the city, in Mani Square mall, along the Eastern Bypass by the name of Chapter 2. Two brothers, Mr. Shiladitya Chaudhury and Mr. Debaditya Chaudhury, are behind this newest and happening restaurant who has also opened Oudh 1590, a fine dining restaurant with two outlets one in Salt Lake and one in Deshapriya Park. 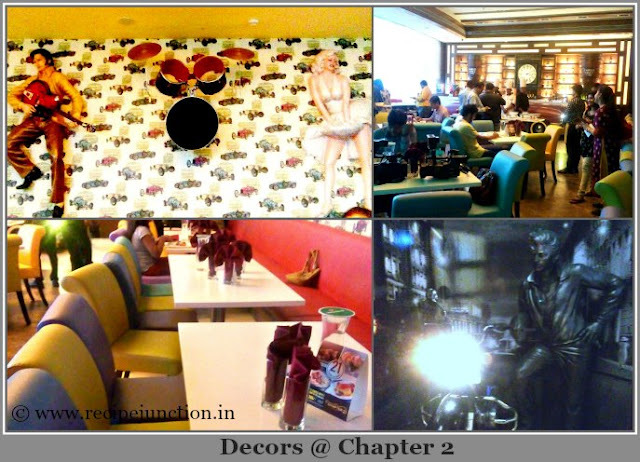 Chapter 2, is made on the theme of old time Park Street night club culture with Anglo-Indian food and live music shows. A side-stage full of musical instruments, life size Elvis Presley and Marilyn Monroe, also a life size drum on the wall depicts the night club atmosphere in a very artistic way. 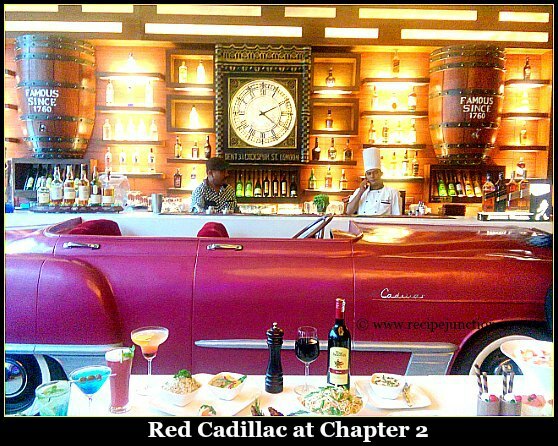 Another attraction of this place is a classic red color Cadillac which brings a feel of old times to this place. Every little decoration of this place showcases the great sense of taste of the owners and their love for cars, bikes and music. Chapter 2 is a 70-cover restaurant with a Private Dining Area for hosting 20 pax. 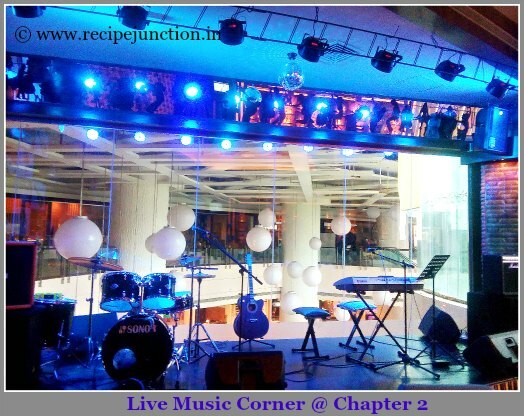 Apart from the food, the major attraction of Chapter 2 is the retro live music that is being performed every evening by some of the oldest bands of Kolkata. On an invitation from Chapter 2, I went there with my co-group member Urmi Ghosh to represent Kolkata Food Bloggers on the occasion of their launching of LUNCH BUFFET. Their 21 course lunch buffet will be available from Monday to Friday, every week. Renowned actor, Mr Soham Chakraborty was also present to launch the menu. 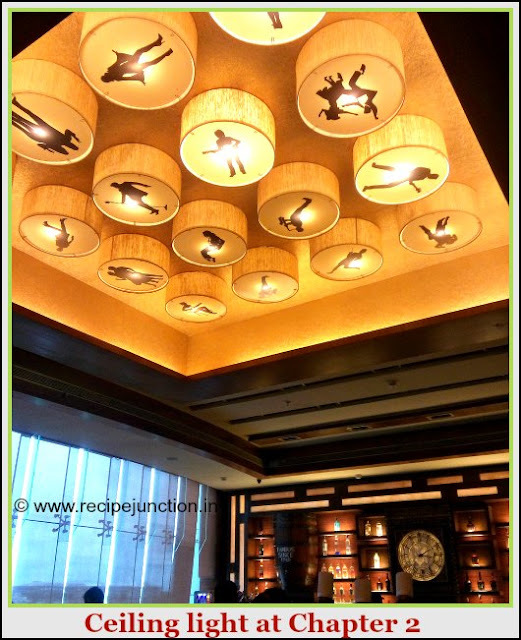 The elaborate menu consists of Chapter2's speciality Continental cuisine and also Kolkata's favorite Chinese Cuisine. The owner Mr. Shiladitya Chaudhury stated, " We have noticed that there is a dearth of continental items in the buffets that are served in standalone restaurants of the city. Thus, keeping in mind the peoples love for gourmet continental cuisine we are introducing this one of a kind 21 course buffet and have even kept the price very economical." 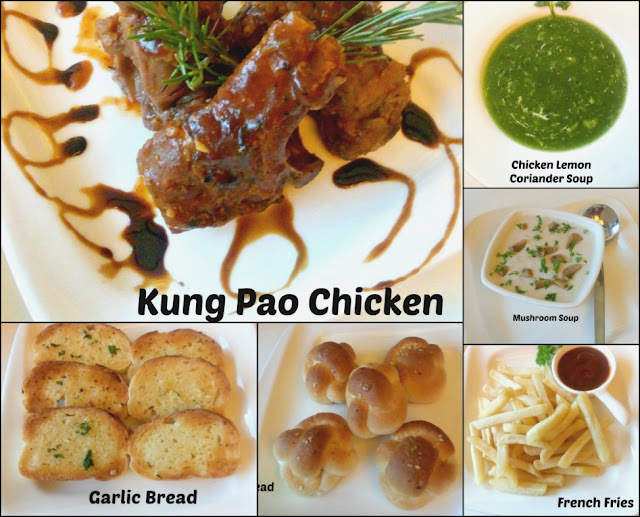 Co-owner Mr. Debaditya Chaudhury stated," Though continental cuisine is the speciality of Chapter 2, we have recently introduced Kolkata's quintessential favorite Chinese cuisine in our a-la-carte menu. Hence, we decided to include some of our signature Chinese preparations in the menu." The buffet menu comprises of 2 soups, 4 salads, 3 starters, 4 main dishes, 3 staples including rice and noodles, 2 types of breads and 3 desserts. Some of the items which will be part of lunch buffets are Chicken Talumein Soup, Chicken lemon coriander soup, Cream of tomato soup, cream of Mushroom Soup, Kimchi salad, Cold Chicken Salad, Egg Potato salad, Daikon Salad, Chicken Ceasar Salad, Drums of heaven, Kung pao Chicken, Chilli Shrimp, Pan Fried chilli fish, Fish pepper salt, Nachos tomato salsa, Corn mushroom toast, Chicken stroganoff, Chicken Tetrazzini, Chicken in red bell pepper, Prawn in sweet chilli sauce, Garlic prawn, Grilled fish lemon butter, Vegetable Cannelloni, Chilli tofu, vegetable lasagne, Babycorn Florentine, Egg chicken fried rice, Vegetable Hakka noodles, Burnt garlic fried rice, Spaghetti tomato sauce, buttered rice, Darsaan, Brownie, fruit custard and last but not the least, Ice Cream. The buffet is priced at Rs. 399 plus taxes per person. The good thing about this buffet is that the menu is not fixed and will be changed everyday to add a wide variety to the food lover's palate. Another plus point, a glass of Four Seasons wine will be given complimentary to each adult with the buffet. 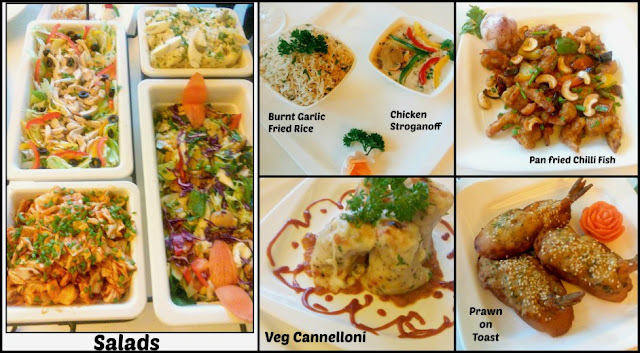 The food :: The food we tasted were all very delicious and some of them were really very appetizing, like, Prawn on the toast, veg cannelloni, Pan fried Chilli fish, Kung Pao chicken and even the salads were quite delectable. If you love to devour Continental and Chinese Cuisine along with some music then don't think twice. The price is also very economical, as for such a lavish spread, the price is quite less comparing other such fine-dining restaurants.